When this trip was still on the working table, I realized that a day would not suffice to see and experience the totality of island's charm and beauty. Camiguin Island may be the country's 2nd smallest province, but in terms of tourist hot spots or places which we can go adventurous, it is gargantuan. From the steep forest trail of Mt. Hibok-Hibok, here comes the woodland again. Then one by one, signs of civilization emerged, a bahay kubo, a domesticated carabao, a farmer, and some barbed fences.We know for sure, that the hike will end any time soon. So when the pools and cabanas finally came to sight, we were so relieved. Our 6-hour hike in Mt. Hibok-Hibok is over (an account of our Mt. Hibok-Hibok climb in this link). Ardent Hot Spring, a government owned resort at the foot of the famous volcano, marks the end of our traverse dayhike. The quaint resort has a number of good pools that varies in size. The largest one can be found at the upper level while that smallest at the lowest part. All of which are filled with water coming from the mountain. But strangely, for some reason, only the small pool has this warm water. Naturally, it was here that we spent most of the time. Since our hike ended in this resort, we might as well stay here and relax even for a few minutes. We deserve it anyway. From 11:30 AM until 1 in the afternoon, we stayed in Ardent chilling and relaxing. 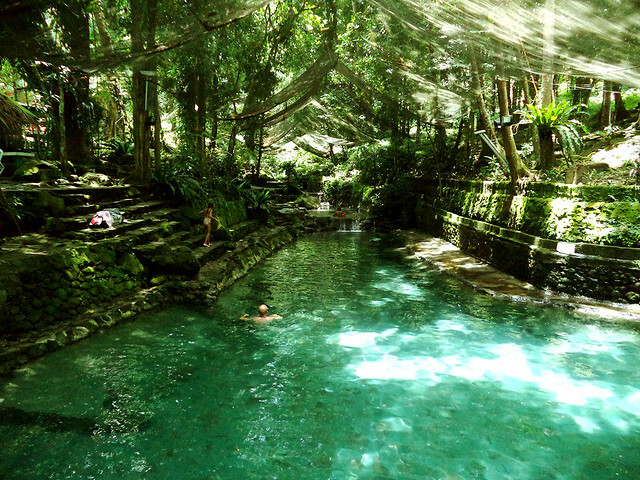 We went here and there to try the cold and warm waters. I also went under the plunge of the mini waterfall and received a natural back massage. Oh this is life! 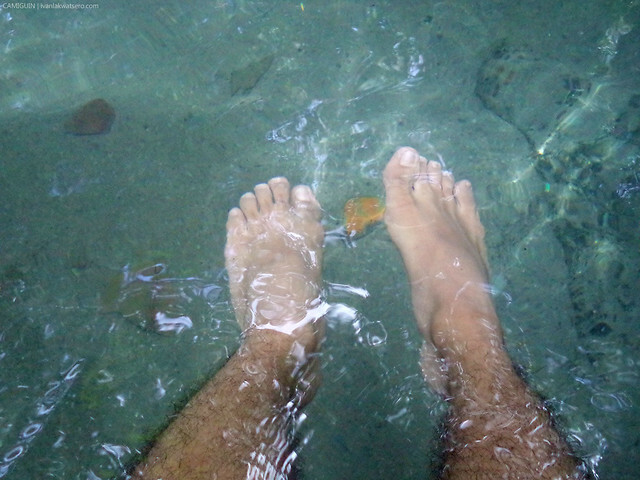 after walking for about 6 hrs, the feet love the warm water. Then at the middle of a good conversation, we realized that we haven't taken lunch yet. Gutom na kami! So we walked into their canteen and tried a sinigang meal to complete our day. The three of us enjoyed the dish, sarap! By 2 PM, it's time to bid goodbye to the hot springs so we could move forward to our next destination. Ardent Hot spring is indeed the perfect post-climb reward. 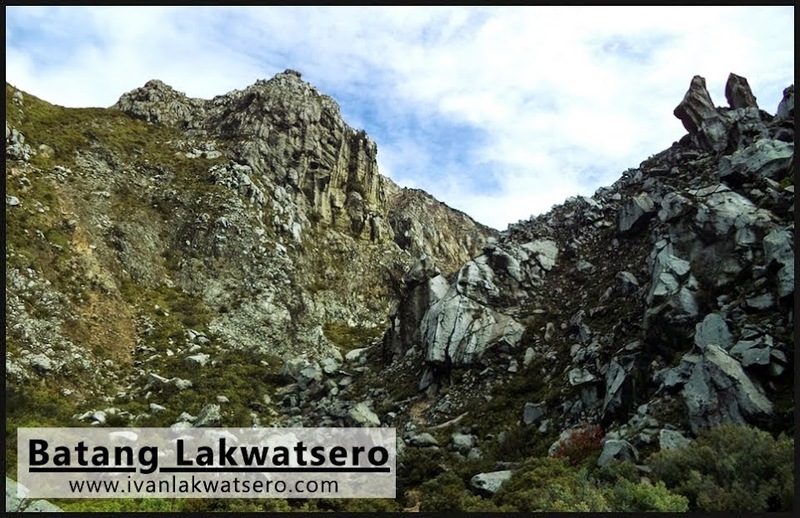 Located also in Mambajao, right at the foot of Mt. Timpoong, the highest mountain in the island (and also our target destination for tomorrow), Katibawasan Falls is our next destination. 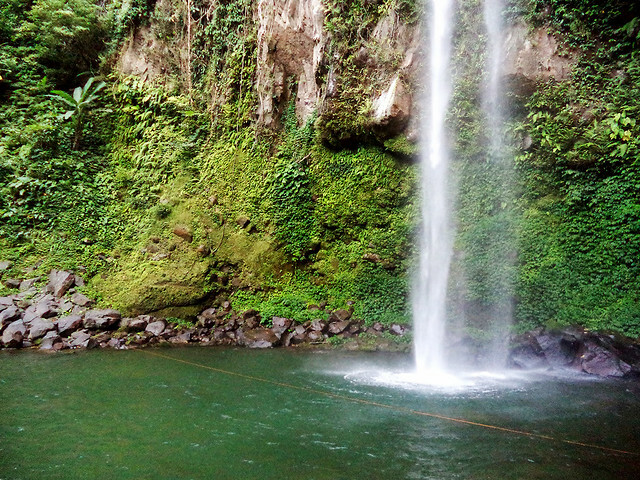 Among the many toursit spots in Camiguin, this is one of the most frequented, given that it is easily accessible by a road and needs not a long trek once there. A fee of P20 was collected upon entrance. This is because the local government had the place developed, built concrete stair steps to the falls, as well as a picnic ground in the vicinity. I like what they did here, but would love it more if they just left it in its natural state. Upon seeing the falls, I initially reacted, "wow, ang taas pala niya." 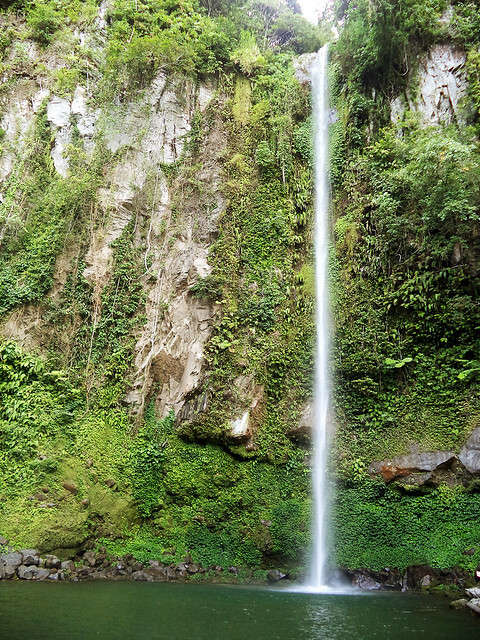 Katibawasan Falls is probably one of the tallest waterfalls I've seen, plunging from a high cliff of at least 70-ft.
Katibawasan Falls. It looks really tall especially when you see it personally. Warning. Rocks might fall from above, getting under the falls is not allowed. The catch basin is wide and deep, ideal for swimming, but the water was really cold. Hindi ako mahilig lumusong sa malamig, so I turned it down. Anyway, we just came from another body of water (Ardent Hot Spring) so taking a dip into the cold water was not really a priority. We did not stay here long. After taking a number of good photos, we decided to leave the place to proceed to our next stop. But upon checking our list, there's no next stop. Katibawasan falls was our last for the day. We checked the time, it's only 4:30 PM, still too early to stop exploring. So we asked Kuya Ronald, "what else makes Camiguin Province special?" "Marami pong lanzones dito. Nandito yung pinaka masarap," he proudly exclaimed. True that. Just like the Province of Laguna, Camiguin is also very well known to produce this sweet succulent translucent fruit. 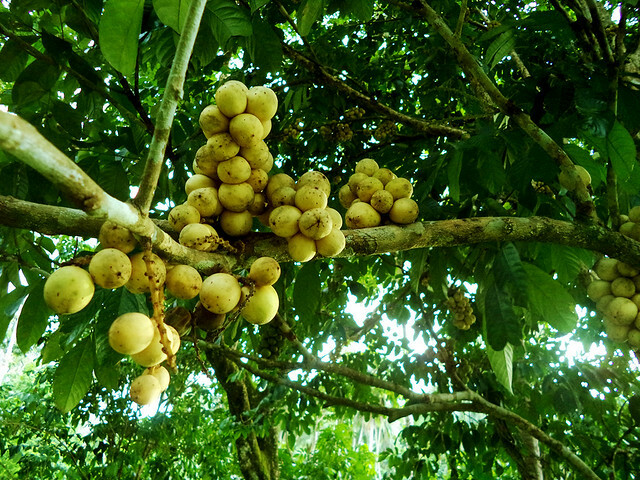 As a matter of fact, the island has its own variety of lansones (Lansium domesticum) that is sweet and and really a favorite by many. Hence, they have this Lanzones Festival every October when the fruit is in season. We asked Mang Ronald to bring us to where we can find these lansones, and by that, we mean not just a fruit stand, but the tall tree itself. On his motorbike, we roamed around the town looking for lansones trees. Plenty of trees were spotted on the roadside, but these were all fruitless (because it's not yet the season). According to Mang Ronald, when in season, the fruit bearing tree won't go unnoticed. while on the road, we spotted this. 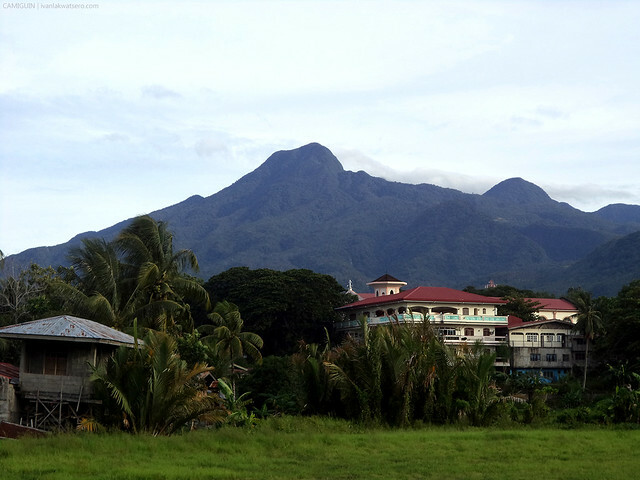 A very nice view of Mt, Hibok-Hibok. and also this, Mt. 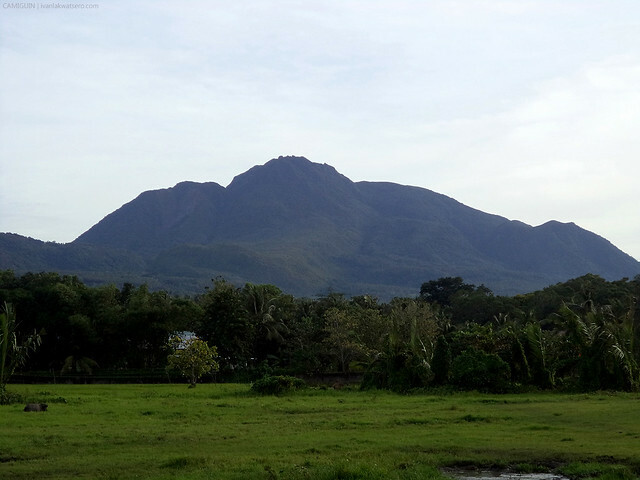 Timpoong, the highest mountain in the whole island. We're scheduled to climb this mountain for tomorrow! 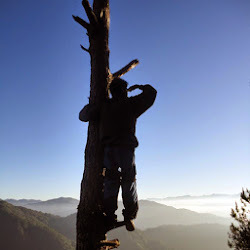 Our guide doesn't want to disappoint us so he brought us even to the far-flung areas of Mambajao. Luckily, on a strip of road near the foot of Mt. 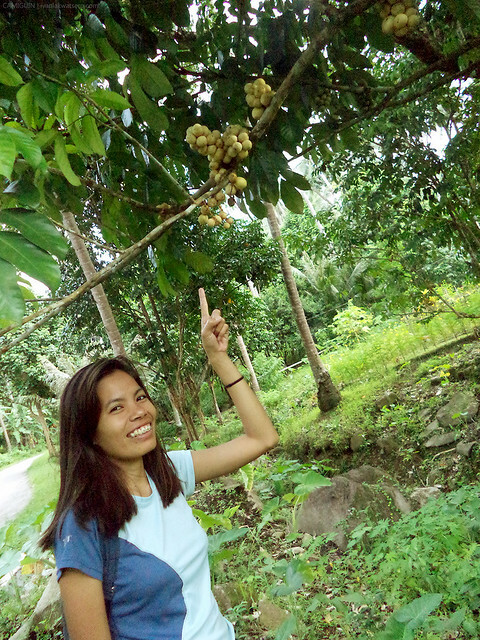 Hibok-Hibok, we found a number of trees with bunches of round lansones. the lansones tree that made our day. I wanted to pick some lanzones pero bawal. Photo opportunities with lansones tree was really awesome, the simple joy that made our day. End of day 2. Story of our hike up the highest peak in the island, and our White Island beach trip to follow soon. 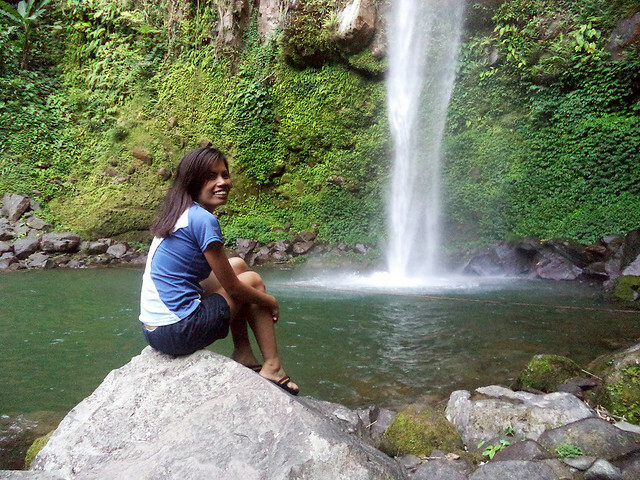 This post is Part 2 of 5 of my Camiguin Island travel series. Check the following links for the other stories. Hi! I enjoyed your post very much. We're going to Camiguin this August. Can we go to the hot spring without having to hike all the way up to Mt. Hibok-Hibok? Thanks! Sobrang lamig nga sa Katibawasan. We visited it after the White Island beach bumming kaya ayos lang sa grupo na lumusong..pantanggal init din.